Preheat oven to 400 degrees. Place chicken on a rimmed baking sheet; season with salt and pepper. Roast until an instant-read thermometer inserted into thickest part of breast (avoiding bone) registers 165 degrees, 25 to 30 minutes. Let cool slightly; discard skin and bones. Shred meat, and set aside. While chicken is roasting, heat 2 tablespoons oil in a large saucepan over medium. Add carrots, onion, and thyme; season with salt and pepper, and cook until carrots are crisp-tender, 8 to 10 minutes. Add flour, and cook, stirring, 1 minute. Gradually add milk, stirring until smooth. Cook, stirring occasionally, until mixture comes to a simmer and thickens. Remove from heat; stir in peas, lemon juice, and chicken, and season with salt and pepper. Pour filling into a 9-inch deep-dish pie plate. Stack phyllo on a work surface. Using a paring knife, cut out an 11-inch circle from the stack; discard trimmings. Stack 2 circles on work surface, and brush gently with 1 teaspoon oil; repeat with remaining circles and oil. Place phyllo stack over filling, and press down about 1/2 inch from the edge so phyllo fits inside rim of pie plate. Bake until golden and bubbling, 20 to 25 minutes. 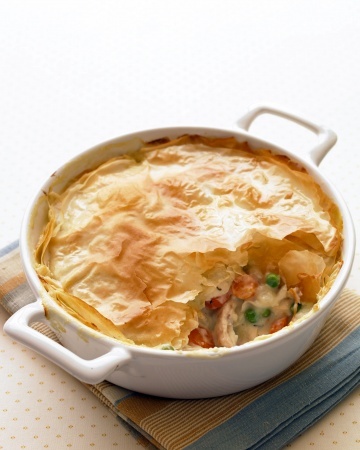 Let potpie cool 15 minutes before serving.